"'Redout': a condition experienced by pilots in which blood is forced to the head and results in a reddening of the field of vision during maneuvers that produce a negative gravity force. 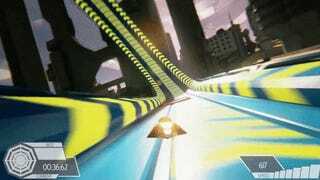 Also, the fastest arcade racer since the good old days of F-Zero and WipEout." "It's actually closer to F-Zero than WipEout. It's not easy to explain without being able to put a controller in your hands, but the ship handling is very different. There will be more focus on racing rather than blasting other contenders, along the lines of POD and Trackmania. It will be really, really fast from the start." Apparently you'll be able to move at 800 km/hr. So yeah, that kind of fast. If all goes according to plan, it'll be out in March on Steam, PlayStation 4, and Xbox One. That's good news, except—rather unfortunately—for Nintendo fans, seeing as it's not coming to their platform of choice and Nintendo doesn't seem super stoked about the F-Zero series these days. It's a shame too, seeing as F-Zero GX was brilliant. Thanks for the heads-up, PCGamesN.